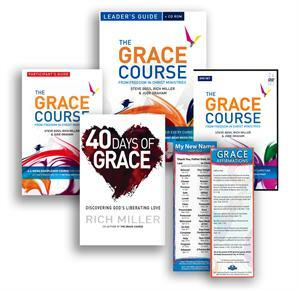 Includes DVD, Leader Guide/CD ROM, (10) Participant Guides, (1) 40 Days of Grace Devo and 1 pack of 50 Grace Bookmarks. We all know the song, "Amazing Grace" and sing it all the time. But are we experiencing God's grace on a daily basis? In a survey that FICM conducted with the Barna Research Group, 82% of American Christians surveyed believe that "Trying hard to obey God's commands" is a good way to sum up the Christian life. Now, there's nothing wrong with that statement...except that it is totally wrong! There is nothing in there about grace, faith, hope, and love. There is nothing about Jesus! Too many followers of Christ believe they need God's grace to be saved, but then live the rest of their lives as if it were all up to them. The Grace Course was developed to help change that thinking. In Christ, we have received our introduction by faith into God's grace in which we stand (Romans 5:2). We need to grow in the grace and knowledge of our Lord and Savior, Jesus Christ (2 Peter 3:18). And we are to be strong in the grace that is in Christ Jesus (2 Timothy 2:1). In six powerful, grace-filled DVD teaching sessions, Steve Goss (FICM-UK director) and Rich Miller (FICM-USA director) challenge the spiritual status quo of Christianity lived in one's own strength, striving to gain or maintain acceptance with God through self-imposed or church-imposed rules and regulations. In Session One, walk with Jesus through the story of the prodigal sons. In Session Two, grasp hold of your forgiveness in Christ and cancel your guilt trips! In Session Three, you'll learn how to exit from a shame-based identity into the newness of life that is yours in Christ. In Session Four, find the freedom from fearful living into a new walk of faith and courage. In Session Five, discover the keys to jettison pride and step into a powerful life of humility. And finally, in Session Six, you'll have the opportunity to enter into the "grace-rest" life of abiding in Christ in the presence and power of the Holy Spirit. Each DVD session provides three opportunites for small group discussion in the "Pause for Thought" segments. Powerful testimonies of changed lives are also interspersed with the teaching. 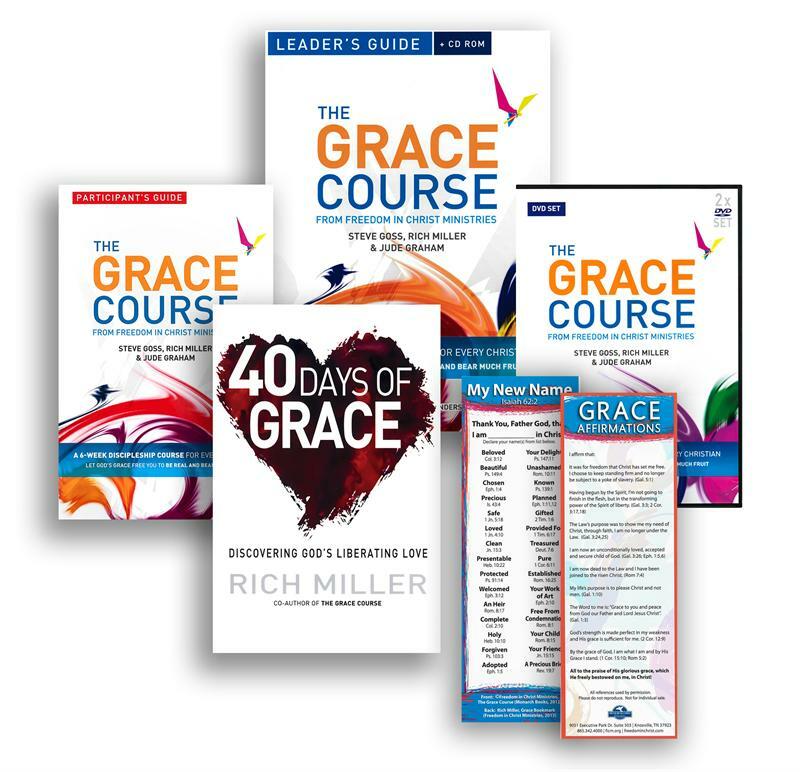 The Grace Course also has a complete "Leader's Guide" for those who wish to teach the sessions "live" as well as a "Participant's Guide" for notetaking and effective learning along the way. ALSO: In the spirit of FICM's "Steps to Freedom in Christ", The Grace Course has a DVD session called "Steps to Experiencing God's Grace" with a complete copy of these Steps included as part of the Leader's and Student's Guides. You won't want to miss this "punch line" of The Grace Course, as the chains of living under the law and performance-based acceptance fall off. You will be amazed by God's grace! Prepare yourself for a life-touching, life-transforming journey to the heart of the God of grace through The Grace Course. We believe you will never be the same!